Air suspension and/or Fuses 101? from which I began to check fuses for the air suspension. In the rear fuse block, I checked fuses 79 (7.5A) and 87 (30A). They are good – but as I went to plug them back in, both felt looser than the rest. Closer inspection of their slots showed that there appears to be only one-half of the socket for them to plug into!? You can’t have a circuit without both prongs of the fuse plugged into something, right? These are the only fuse sockets like this on the rear fuse block – all others have metal sockets for the prongs of the fuses. You can see all this in the photo I uploaded. For example, you can see both metal sockets for slots 77 and 78. A quick inspection of the backside of the block shows no obvious missing or loose wires, no dangling sockets, etc. So, what am I missing here? I hope someone can help as I am very baffled and my troubleshooting is at a standstill. Thanks in advance for any advice or education. Last edited by Clutch; 08-02-2014 at 08:06 PM. Looks like the top connection got pushed through to the back of the fuse block. Pull the fuse block out and see what is behind there. Likely the missing terminals. OK, so I took the panel even further apart and did a very thorough examination. As you can see in the new photo, there are no wires going to slots 79 or 87 whatsoever. No missing sockets, no evidence of modification. Looking at the harness coming to the fuse block shows no broken or cut wires whatsoever. Looks bone stock. Gentlemen I am convinced, at least for my vehicle, that these fuses were never wired into the circuitry. So for dozens of posts that talk about fuses 79 and 87 affecting the air suspension, I don’t know what they are talking about. My 4.8is has the full four corner air suspension. Are the fuses wired differently from the other (rear axle only) E53s? Maybe that’s it? Why such a change/difference? Are my air suspension components properly electrically-protected somewhere else? Why are the fuse box maps and owner’s manual referring to useless fuses that don’t connect to anything? My bafflement continues, but I am going to button her up for now. Please continue to chime in; I’ll be watching this for a long time. Thanks! Yes the EHC2 is wired differently than the one axles. There is no "fuse issues" on our 2 axles versions as opposed to the 1 axle guys. Fuse 87 is in the trunk right side panel by the relays, but it's just for the compressor. Thanks very much Ricky Bobby. When you say “the actual fuse for the air suspension” what do you mean? What component is that fuse protecting if not the compressor? Does it protect the computer? I will look for the fuse and panel you mention this weekend. I have had the trunk floor, spare tire, and compressor removed several times to access the battery compartment but I do not recall seeing anything that looked like a fuse panel. I must have missed it. (a quick search of the forum and web did not yield an illustration). It would be great to find the fuse in there blown. Speaking of fuses, on the glove compartment fuse panel, does anyone know what is meant by “Secondary Air Pump”, fuses 51 (10A) and 62 (50A)? What could that be? RB is correct on the fuse location. If you access the spare tire, looking towards the left, you will see a blue/white colors fuse block that contains the LittleMEGA fuses. Secondary Air Pump is emissions related, not air suspension. Its an air pump that injects air upstream of the intake when the vehicle is on a cold start just so that the air/fuel mixture remains right, otherwise you'll run really rich until the car is warmed up. 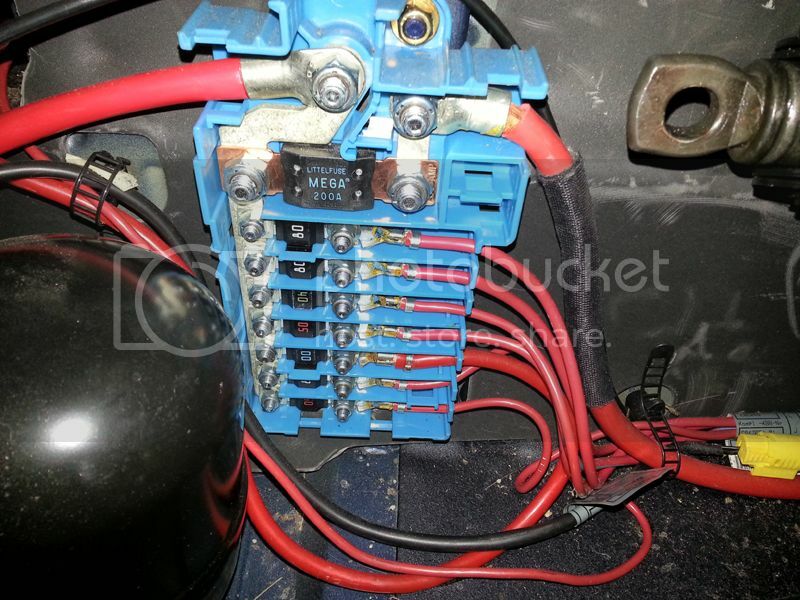 When you're in the trunk floor and looking for the fuse block, it does not look like a fuse panel, its an actual fuse block, and yes I'm thinking at the 40 or 50 amp rating it probably protects the module, sensors, and other electrical components. This is the fuse block TTGTR and I are referring to, with the EHCII, again why are you looking at fuses anyway? Very rare to blow on these cars, if you have SLS error I wouldn't waste your time with fuses but hook up to DIS and see what errors the module is throwing. Thanks to all for the replies. Once again this forum and the folks on it are invaluable. First, great explanation on the secondary air pump, thank you so much, an immense help. Second, yes, I went into the trunk tonight and found the fuse block as Ricky Bobby posted. All looked fine but I tested with a meter anyway and all fuses are good. The behavior of the system was normal except for the overnight loss of air, and even that was sporadic. But the bags were definitely leaking. I put up with it for 2 years, and last summer I installed all four new Arnott air struts myself. The DIY went very well and I was quite pleased with myself. When I reconnected the battery the compressor filled the bags (I did rear first then the front) and I immediately got the SLS inactive message. Easy fix I thought, but off and on for a year I have been trying all of the various reset procedures posted in the forum – except – I do not have any software tools. I did all the battery disconnects, fuse pulls, jack car up and down, drive backwards, key on/key off/door open/door close, you name it. I can’t clear the message and get the system to work. Finally I had enough and when I had the X in for other service about 2 weeks ago I spent some money on diagnostic time. The BMW tech said there was a leaking air hose, bad accumulator, bad sensor (no details), and leaking “valve block”. Estimated additional repair cost on top of diagnosis money already burned: $2638, with no guarantee it wouldn’t require more. Tidbit: the middle green light on the height adjust rocker switch was illuminated when I took it in to the dealer, and not illuminated when I picked it up. I don’t know what they did, but it was hard to argue with the guy since the system functionality was not worse. Hhmmph. I didn’t believe the “diagnosis" so I didn’t proceed. Don’t have the cash anyway. I’m baffled. My system was working near-perfect when I did the straightforward strut replacement. I could raise and lower. I was careful and didn’t pinch any lines or fry any circuits. I check ride height sensors and everything else I can think of. The system is airtight – none of the corners have budged a millimeter in 13 months. So I’m trying a last round of simple things before I consider taking a portion of the saved $2638 and finally investing in some software. I do not really need the ability to raise/lower; I can live with that – but the SLS message has been driving me crazy for a year now. Plus, if I decide to sell, that message has to be fixed or explained sufficiently – and by that I mean with little or no cost to the potential buyer. Sorry for the long post but you can probably sense my frustration with the suspension system just as so many others have. But having the dealer tell me (via the polo-shirted greeter guy) that kind of info and price has made me have to just keep living with it. As long as the bags hold the air and keep the level, it’s just not worth it to purse the raise/lower functionality. Unless someone has a good idea or trick I haven’t tried. I guess I’ll just put tape over the message center! I will guarantee and bet a solid Benjamin Franklin that when your air suspension was leaking it burned the compressor out and now it's not running in spec to the module. Your code is an accumulator filling code due to the compressor not reacting fast enough to fill within spec. You can rebuild the compressor with a seal kit readily found on eBay "wabco compressor repair" for $50, reset the module faults, and enjoy not looking at the SLS fault anymore. It's a common problem when leaking air suspension goes too long without fixing, good luck but based on what you're saying that is your issue! You are almost there don't give up now!